Obituary – Nagel, Francis Raymond “Bud” « Perry High School Alumni Association, Inc.
﻿F.F.A. 53-56, Basketball 53, Wrestling 53-54. 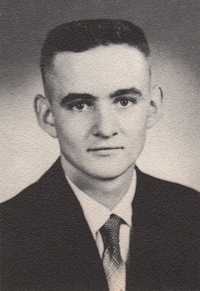 Francis Raymond “Bud” Nagel, 71, of Perry, Oklahoma, was born to Ray H. and Cecelia Fiedler Nagel on May 18, 1937 in Enid, Oklahoma. He returned to our Heavenly Father on Thursday, February 19, 2009 at the Stillwater Medical Center in Stillwater, Oklahoma. He grew up on the family farm west of Perry, Oklahoma. Bud graduated from St. Joseph Catholic grade school and then graduated from the Perry Public High School in 1955. 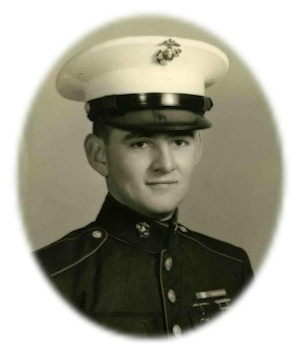 He served his country as a member of the United States Marine Corp from 1955 to 1957 during the Korean War. After his honorable discharge, he returned to Perry where he lived until his death. Bud was a known outdoorsman for his hunting, trapping, fishing skills and knowledge. He was a well known wood carver, leather worker and craft man. In his later years he worked at the county jail, taught hunter’s safety classes for the Wild Life Department and became a photographer of wild life. In the most recent years he was known for the hundreds of humming birds that used his many humming bird feeders at his home. He was a member of the St. Rose of Lima Catholic Church. He also was a member of the Federal Wildlife Association, the Oklahoma Trapping Association and a lifetime member of the NRA and he enjoyed being a master trapper and a hunter’s education safety instructor. Mass will be 11:00 a.m. Monday, February 23, 2009 at the St. Rose of Lima Catholic Church. Father Tom Dowdell will officiate. Interment will be in St. Rose of Lima Catholic Cemetery. Services are under the direction of Brown-Dugger Funeral Home. A Rosary will be held at 6:30 p.m. Sunday, February 22, 2009 at Brown-Dugger Funeral Home. Following the Rosary from 7:00 to 8:00 p.m. the family will receive friends. Memorials may be made to the Oklahoma Wildlife Federation in care of Brown-Dugger Funeral Home, 1010 N. 7th Street, Perry, Oklahoma 73077. Bud is survived by three sisters, Theresa Nagel Smith and her husband, Charles, and Barbara Nagel, all of Oklahoma City, Oklahoma and Carol Pritchett and her husband, Hal, of Perry, Oklahoma; two nieces, Theresa Unruh of Yale, Oklahoma and Catherine Pritchett of Perry, Oklahoma; one nephew, PR Pritchett of Edmond, Oklahoma and one great-nephew, Johnathan Pritchett of Yale, Oklahoma. He was preceded in death by his parents. Bud will be missed and remembered forever by his three sisters who knew and loved him so much. And his friends, Tony and Bennie, who have helped us take care of him the last years of his life. We will not forget you and we will never forget Bud.